Blue_A9_Envelopes_-_5_34_x_8_34 is rated 3.5 out of 5 by 2. Will this size hold a card that is 5.75 by 8.75 or do I need slightly larger? Thanks! You will be able to fit that size into this envelope, but it will take patience to get it in. If you are on a time crunch, I would go with our A10 teal envelopes. Hope this helps! If it’s blue it’s for you! No color is as widely accepted and liked as blue, and that’s a fact. Effortlessly bringing a calm, cool and collective presence to a mailbox near you, these Blue A9 Envelopes are perfect for just about anyone (except maybe hipsters, the devil, Cruella de Vil, you know those types). 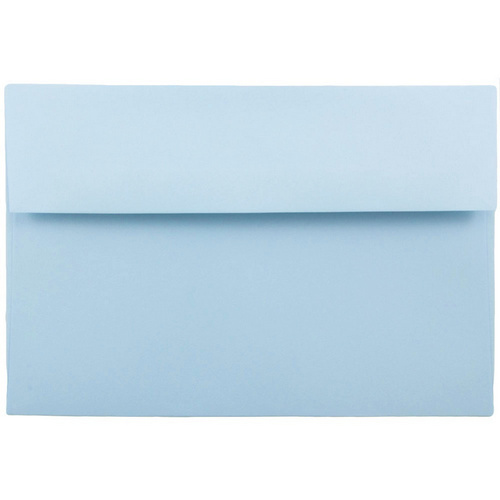 Great for invitations, greeting cards, letters and more, these Blue 5 3/4 x 8 3/4 Envelopes are perfect for anyone in search of a stylish yet professional envelope. Perfect for half a piece of standard sized paper, you can use them for pasically anything! Use them for baby showers, New Years Eve, Hanukah. Use these blue 5.75 x 8.75 envelopes for business promotions such as flyers or advertisements. Blue is a worldly color, so you know you can't go wrong (except for the people listed above ... maybe). These Blue A9 envelopes measure in at 5 3/4 x 8 3/4 and feature a rectangular gummed flap. Available in 6 shades of blue: Baby Blue, Presidential Blue, Navy Blue, Teal, Aqua, and Blue Pearl Stardream Metallic Vflap.